Nosebleeds are common occurrences, affecting one out of every seven people at some point in their life, according to the American Academy of Otolaryngology. They are typically caused by the rupture of small, fragile blood vessels, either at the front (anterior) or back (posterior) part of the nose. Most nosebleeds occur within the lower end of the nose in the lower septum—the wall separating the two airways of the nose that ends in the nostrils. These blood vessels lie close to the surface, making them susceptible to injury. A clue that a nosebleed is anterior is that blood will flow out of one nostril when the affected person is sitting or standing. The good news is that anterior nosebleeds usually do not require medical attention unless the bleeding cannot be stopped, or when it happens in the very young. The most common cause of anterior nosebleeds is trauma such as a blow, smack, or sometimes just picking the nose. Dryness inside of the nose can also cause bleeding. In addition, high altitudes, colds, allergies, and medications are all potential culprits for triggering a nosebleed. Smoking can dry out the nose too, so quitting is especially important for recurrent nosebleeds, among many other health benefits. Try to remain calm and not panic. Sit up straight and lean forward a bit to prevent blood from going into the throat. Pinch the nostrils together using your thumb and index finger firmly for 5 minutes. Repeat for 10 more minutes if bleeding is still occurring. You can place a cold compress or an ice pack across the bridge of your nose. Vaseline can be used if the cause of the nosebleed is dryness. This is a good preventive strategy too—place vaseline gently inside the nose using the tip of your finger or cotton swab three times daily. When the bleeding stops, do not jump up and down: take things easy, and do not blow or pick your nose or it will dislodge the clot and will probably reactivate your nose bleed. The blood loss is heavy. If you get nosebleeds often. If the injury/trauma is severe. If nosebleed occurs as a result of a head injury. The person is an infant or child, or if the person is already sick or elderly. If a nosebleed does not stop after 10 to 20 minutes of direct pressure. If you are at all worried about the nosebleed, seek further medical advice. Upper septum or posterior nosebleeds are much rarer. Bleeding begins high within the nose and blood flows down the back of the mouth and throat even when the person is sitting up or standing. These nosebleeds can be very serious and do require urgent medical attention. There are a number of potential causes of upper septum nose bleeds but more common ones include people with high blood pressure and an injury to the nose. 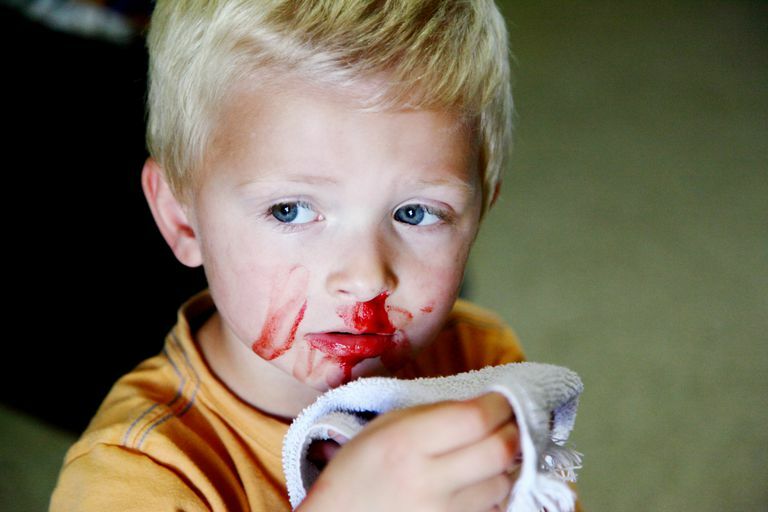 Older people too are more likely to develop posterior nosebleeds than children or younger adults. Treatment is initially the same as for anterior nosebleeds. Your doctor may pack the nose with gauze (do not try packing yourself) or an inflatable latex balloon if the bleeding does not stop. Cauterization of the bleeding blood vessel may be required. This involves an electrical or heated device to burn the ruptured blood vessel to stop the bleeding. The doctor uses a local anesthetic before he or she begins this procedure. Sometimes too, minor nosebleeds just happen, and you never know the reason. American Academy of Otolaryngology—Head and Neck Surgery. (2015). Nosebleeds. Should I Tilt My Head Back to Stop a Nosebleed?